Torque Morrison is a biker without roots, and he likes it that way. 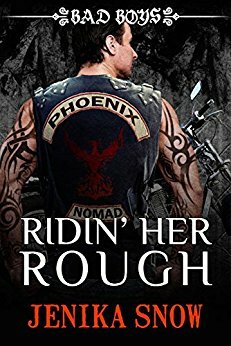 The pierced and tattooed member of the Phoenix MC Nomads is a bad boy who’s lived hard and struggled with addiction—of the curvy variety. Torque knows he should stay away from Rush Falls, but that’s easier said than done. The town is home to the one woman he can’t have. Delilah Stringer is a voluptuous brunette half Torque’s age. As the daughter of the president of the Rush Falls Chapter, she’s no shrinking violet. The outlaws she grew up around may be crude and nasty, but they’re also protective—they’d never approve of her being with a player like Torque. She may want him, but he’s never shown interest in her. That is, not until one drunken night when she gives him her virginity.